So I usually don’t talk much about what’s going on in my personal life but I have people ask me for motivation in their IM Journey all the time so I thought I would write about my recent purchase due to Internet Marketing. 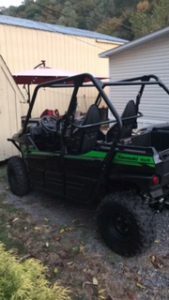 I live in mountain terrian and I am always wanting a break from my computer desk and a fun thing to do in the area I live in is to go 4 wheeling so I purchased a Side By Side. Here is an actual picture below. Well guys and girls I would like to say it’s been a money making January and I am in the Caribbean Celebrating but that would be a lie. It has been slow this month and it usually is because most people have spent all their money at Christmas (Don’t worry Tax Season Is Almost Here!!!). I have however been trying a new autoblogging method that is making me a few bucks a day and here in a few weeks I will share it with you. Can You Make A Full Time Income Online? When I first got into making money online. One of the first things I wanted to know is can sole proprietor like myself make a full time income online? What I have found to be true is it depends on a few things. Author SmootPosted on May 31, 2014 Categories MotivationLeave a comment on Can You Make A Full Time Income Online?